The 1990s proved to be a tumultuous decade for North American sports car racing. Opening with the "glory days" of the IMSA GTP Prototypes that was documented in last week's report, the decade concluded with open wounds that led to an acrimonious split that is only now healing with the IMSA WeatherTech SportsCar Championship. Major teams with the Porsche 962, Jaguar XJR-12, Nissan GTP-ZXT, Ford Probe GTP, Chevrolet Spice and Toyota-Eagle Mk III produced full fields and great racing. However, with the great cars came spiraling costs, driving away the smaller teams and eventually even the factories called it quits. By 1993, only Dan Gurney's All American Racing remained. P.J. Jones set the all-time Daytona sports car qualifying record with a lap of 1:33.875 (136.522 mph), and then joined Rocky Moran and Mark Dismore in a 10-lap victory over a GTS Ford Mustang fielded by Jack Roush – his ninth consecutive victory in the class. At Sebring, Juan Fangio II and Andy Wallace scored their second consecutive 12 Hour victory in the team's No. 99 Eagle. The team went on to win every race it entered (it sat out the Road America round with the title well in hand), and Fangio and Jones finished 1-2 in the final standings. The GTP era came to a close when Jones took the checkered flag for the season finale at Phoenix. IMSA was ready, though, with a new open-cockpit prototype – the World Sports Car. As early as 1988, five-time IMSA champion and two-time Rolex 24 winner Al Holbert was working on an open-cockpit Porsche prototype. Serving as director of Porsche Motorsport North America, Holbert met with IMSA officials shortly before his untimely death in a plane crash on Sept. 30, 1988, on the eve of the IMSA GT race in Columbus, Ohio. With the loss of factory teams over the next two years, plans for the new class accelerated. Plans were announced to competitors at the end of the 1992, with theGTP cars eligible for only one more season. The WSC debuted at Miami in 1993, with Brent O'Neill finishing 12th in a Buick-powered Kudzu as one of two cars in the new class. By the end of the year, five cars were on the grid for the Phoenix season finale, won by Andy Evans and Fermin Velez in a Buick Kudzu. At first, WSC was populated by chassis based on cars competing in the Camel Lights class for smaller GTP Prototypes – with more powerful engines. Some cut the roofs off existing GTP or Lights cars. Other showed ingenuity, such as Rob Dyson, who put a Ferrari 348 engine in a Spice chassis. The World Sports Car opened the 1994 season as IMSA's lead class – and competed at Daytona and Sebring for the first time. Clayton Cunningham's Nissan 300ZX, competing in the GTS class, won overall in both of the Florida classics. Scott Pruett won his first overall victory in the Rolex 24, joined by Paul Gentilozzi, Butch Leitzinger and Steve Millen. At Sebring, Johnny O'Connell joined Millen in the same car. A Harry Brix-owned Oldsmobile Spice won the class at the Rolex 24, finishing ninth overall with a driver line-up including Jeremy Dale. At Sebring, Derek Bell, Andy Wallace and James Weaver took the class in the Auto Toy Store Chevrolet Spice, taking second overall. It quickly became obvious that it would take more than a homemade special to win in World Sports Car. Ferrari raised the bar when it commissioned the Ferrari 333SP. Realizing it would take more to win than a homemade hybrid, Dyson commissioned Riley & Scott to build the R&S MK III. The two would dominate the class for the remainder of the decade. Looking back, the 1995 Rolex 24 was a great "what might have been" event. Porsche entered a pair of turbocharged Le Mans WSC Prototypes, and tested at Daytona with Mario Andretti and Scott Pruett – with four-time Rolex 24 winner Bob Wollek also in the line-up. Only two weeks before the event, IMSA imposed additional restrictions on the air intakes for the new Porsches – and the factory promptly withdrew both cars. Ironically, the Kremer team raced a Porsche K8 with the restricted engine – and won overall with a line-up including Christophe Bouchut and Marco Werner. The race had a 74-car entry – its largest in recent years – including 20 World Sports Cars. Stealing the headlines from the overall winner was the GTS class Jack Roush returned to the event after a one-year absence, and won it for his 10th straight attempt in the No. 70 Nobody's Fool Ford Mustang. The car was a 70th birthday present for Paul Newman by his Hollywood studio, with Tommy Kendall, Mark Martin and Mike Brockman co-driving. At Sebring, Evans, Velez and Eric van do Poele won in a Scandia Ferrari 333SP. The remainder of the decade was dominated by the Ferrari and Riley & Scott WSCs. 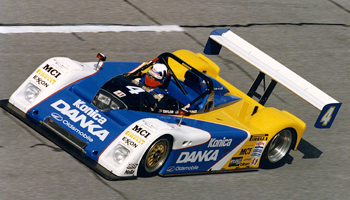 Current Rolex 24 drivers Wayne Taylor and Jim Pace swept both classics in 1996 driving an Oldsmobile-powered Riley & Scott, joined by Scott Sharp at Daytona and van de Poele at Sebring. Gianpiero Moretti, Mauro Baldi and Didier Theys swept both Florida races in 1998, joined by Arie Luyendyk at Daytona in the No. 30 Momo Ferrari 333SP. Velez and Evans repeated at Sebring in 1997, joined by Yanick Dalmas and Stefan Johansson. Dyson's investment paid dividends at Daytona in 1997 and 1999, when a pair of Ford-powered MK IIIs won overall. The 1997 race saw Dyson's lead car break at 6 p.m. He had entered a second car that year, partly for insurance reasons and partly to reward fellow veterans John Schneider and Elliott Forbes-Robinson, who co-drove with the New Yorker. When the primary car broke, that car was six laps down. Butch Leitzinger and John Paul Jr. (later joined by Wallace and Weaver) made up the distance, and Leitzinger prevailed over Velez in a final hour battle. The on-track competition was fabulous. Car counts were also solid – the 1997 Rolex 24 had an 80-car starting field, only two shy of the record set in 1984. However, politics dominated the talk as the decade progressed. IMSA had been in good hands under the leadership of John Bishop. A succession of different owners tried in vain to carry that momentum. Mike Cone and Jeff Parker led IMSA through 1994, relocating the organization from Connecticut to Tampa, Fla., prior to selling it to Charles Slater. Two years later, Evans and Roberto Mueller bought IMSA, and changed its name to Professional Sports Car Racing prior to the 1997 12 Hours of Sebring. Concerned with the future of that sanctioning body, Daytona International Speedway awarded the sanction for the Rolex 24 to a new organization. The USRRC , an alternative series sanctioned by the SCCA, folded only three races into the 1999 season. Impressed with a visit to the 24 Hours of Le Mans, Dr. Don Panoz held a new event to close out the 1998 PSCR season. Styled after the French event, Panoz called it the Petit Le Mans. Encouraged by Panoz and the success of that event, the lead PSCR series became the American Le Man Series, using rules similar to the 24 Hours of Le Mans. The move paid immediate dividends. The BMW factory team won the 1999 season-opening 12 Hours, with J.J. Lehto, Tom Kristensen and Jorg Muller scoring a BMW V12 LMR. A fork in the road had been reached.